Eco-Friendly Moving Tips. Yes, it is possible! Use recycled packing supplies. There's no reason that moving supplies should only be used once. In fact, moving boxes are designed for a bit of wear and tear, so there's no reason not to take advantage of someone's used moving boxes. 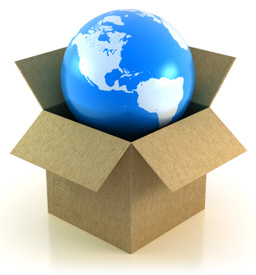 You can ask friends or relatives who are moving or who have recently moved to save their boxes, fillers (try not to use packing peanuts, as those are especially harmful to the environment) and dish wrapping papers for your move. If you don't know anyone to ask, try looking for moving supplies online, on sites such as Craigslist or Freecycle. Not only will using recycled packing supplies create an eco-friendly move, but it will be dramatically cheaper than buying new products. Use wooden or plastic moving crates. If it's hard for you to find gently-used moving boxes, why not try reusable moving crates? You may be able to rent or borrow these sturdy boxes, and they'll probably be cheaper than cardboard boxes. The best part is that they produce virtually no waste or pollution. Avoid the non-biodegradable packing peanuts. You've probably heard that packing peanuts are dangerous, but you may not know why. The short answer is that they're made from polystyrene, a compound which (of course) includes styrene, a chemical that can damage your central nervous system and respiratory systems and cause a range of uncomfortable mental and physical ailments. Standard packing peanuts are also dangerous for the environment because they are not biodegradable. If you must use cushioning materials, try air packs which create less waste, or look for biodegradable alternatives such as starch-based peanuts, which may cost slightly more. Most of us hate packing peanuts, but these ones have a redeeming quality. It is, of course, a small price to pay to protect the earth. Use eco-friendly cleaning supplies. There's no better time to be eco-friendly start than when moving into a new home. You'll probably want to scrub down all the surfaces in your home, and doing it with environmentally-friendly cleaning supplies is a good idea. 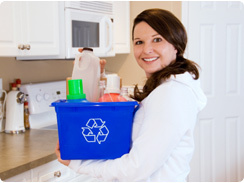 Discard your old, toxic cleaning supplies during the move (why risk taking them when they may spill or leak? ), and replace with cleaning solutions that are good for the environment. Discover the wonders of household vinegar. It's amazing stuff. Not only will eco-friendly cleaning supplies introduce fewer poisons into the environment, but they'll be safer for your children and they'll likely be found in recycled packaging or packaging that creates less waste than standard packaging. Recycle as much as possible when packing. When you're getting rid of your junk remember that most metal objects and batteries can be recycled. You can also donate many of your unwanted items such as toys, clothing and books to others in need so that they can find new homes in proper places, instead of in landfills. Move as little as possible. You'll definitely want to take enough furniture to fit into your new home, but you won't want to have to waste space and gas to lug items that you won't need or that won't fit into your new space. Moving fewer items will reduce fuel costs and may even allow you to hire a smaller moving truck. Moving may be an activity that generates a lot of waste, but by keeping your thoughts focused on the environment you'll be able to play a role in reducing your potential carbon footprint and the impacts that your waste will have on the world. Equally importantly, by undertaking an eco-friendly move (especially a successful one), you'll be able to inspire others to become similarly protective of the earth. And the benefits of this cycle can protect the world in unimaginable ways.